This month, Facility Results (http://www.facilityresults.com) unveiled its fresh, new website designed for easier navigation and browsing. The website features banner slides, a redesigned menu structure, and valuable body content about electrical safety in the workplace, including free safety poster downloads, informative articles, and links to online tutorials. The new Facility Results website highlights Facility Results products and services as well as a number of free resources for keeping workers safe from electrical hazards on the job. This month, Facility Results (http://www.facilityresults.com) unveiled its fresh, new website designed for easier navigation and browsing. The site’s revitalized content is targeted for companies and organizations looking for practical, economical ways to protect their employees and their bottom line from the potential physical and fiscal hazards associated with inadequate electrical safety programs. 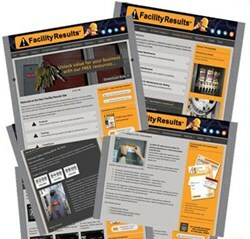 The new website, located at http://www.facilityresults.com, is a powerful blend of the products, training, and services Facility Results delivers, along with a host of free safety poster downloads, informative articles, and online tutorials pertaining to electrical safety in the workplace. The website’s presentation features banner slides and a redesigned menu structure, and every page includes valuable body content and links as well as useful sidebars. In addition, the site is easy to use, fast, and organized for simple browsing. “After six years in business, we’ve learned even more about what customers are looking for and what they don’t know, but should, regarding the benefits of being proactive about electrical safety and compliance. I encourage anyone whose business it is to keep their workers and facilities safe from electrical hazards and compliant with electrical safety standards to visit our new website,” explains Bryan Rupert, co-founder and lead consultant at Facility Results. Founded in 2009 by Bryan and Kelly Rupert, Facility Results of Plymouth, Michigan, offers an extensive collection of electrical reliability and safety solutions in the form of products, services, and training. In addition to FlashTrack™, their flagship software for performing arc flash analyses, the company offers NFPA 70E table-based label solutions, an engineer-assisted arc flash compliance program, a turnkey-engineered arc flash program, electrical system maintenance services, comprehensive NFPA 70E training programs, and workplace safety placarding and poster downloads with an emphasis on Personal Protective Equipment (PPE). Facility Results has conducted hundreds of training sessions across the United States on the NFPA 70E Standard as well as OSHA workplace training, including Lockout/Tagout, Confined Space Assessment, Asbestos Standards, and more. For information on Facility Results and/or its products and services, contact the company at 888.762.0090 or visit http://www.facilityresults.com.